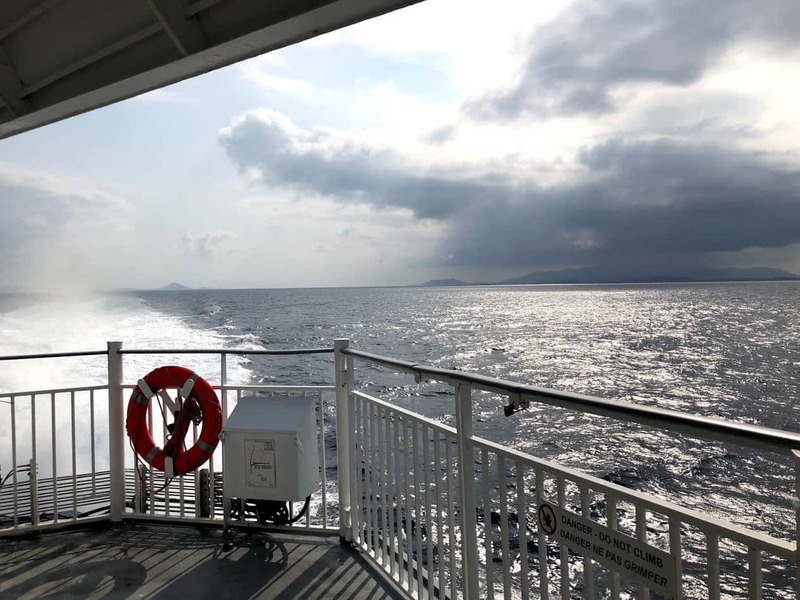 The trip from Ios to Santorini is a popular summer route, as the islands are well-connected with multiple ferry routes every day during the summer months. In the winter, Ios is connected to Santorini three days a week. The distance between the two islands is approximately 45 km (28 miles), so the duration of the trip between Ios and Santorini ranges from 35 minutes to 1h and 30 minutes depending on the type of ferry you choose. Have a look at all the available departure times and ferry routes on ferryhopper.com and choose the itinerary that best suits your needs. Ios and Santorini are neighbouring islands and the short duration of the ferry route between them allows for daily trips as well as island hopping in the Aegean! During the summer months the ferries from Ios to Santorini depart daily from early in the morning until late in the afternoon. In this period there are approximately 5 to 6 high speed ferries travelling every day from Ios to Santorini while the route is also served by conventional ferries 6 days a week. During low season, the Ios-Santorini route is served primarily by conventional ferries around 4 days a week while the departure times are usually in the afternoon. If you are planning to go on an island hopping experience, have a look at the frequent ferry connections from Santorini, here. The ferry ticket costs from Ios to Santorini depend on the type of ferry that you choose to travel with. Usually, conventional ferries (for example Blue Star Delos / Patmos or Adamantios Korais) are the cheapest option with prices ranging from €7 to €15 one way economy class. During the high-season Ios and Santorini connect daily with a number of high speed ferries that cost from €30 to €40 for a standard economy ticket. Please note that these information are based on 2019 data and they are subject to change every year so we would highly recommend to check the ferry schedules and ticket prices before planning your trip to the Greek islands. Should I book ferry tickets from Ios to Santorini in advance? The Ios - Santorini route is popular during the summer, and with Santorini being a destination of high demand we advise you to book your tickets at least 2-3 months prior to your trip. Search Ferryhopper for all possible routes and schedules, and book your tickets as soon as possible to enjoy the beauty of the volcanic island of Santorini. If you want to transfer your vehicle from Ios to Santorini we advise you to book your tickets in advance as the route is very popular and the vehicle tickets sell out fast. Also, keep in mind that some of the high speed ferries don’t have space for vehicles which means that in the case you want to take your car or motorbike with you the departure time options might be more limited. The port of Ios gets quite busy during the summer months with ferries and smaller cruises arriving and departing through the day. Make sure that you calculate some time in advance to reach the port before you depart and if you have any questions about your ferry you can ask the local port authorities. The trip between Ios and Santorini is short but it can often get slightly bumpy due to the wind. There is nothing to worry about! The ferry crew will be able to help you if you get sea sickness, providing you with a sickness bag or an aspirin. If you are planning to stay in Santorini for one night or more, we would highly recommend that you search and book accommodation far in advance. Ios is in a great location for island-hopping to other destinations of the Aegean like Mykonos, Naxos, Paros or Sifnos.